Below post will provide you with the description of Mendeleev's periodic table. You will find advantages and drawbacks of Mendeleev's periodic table. You will also get the Mendeleev's periodic law in this article. 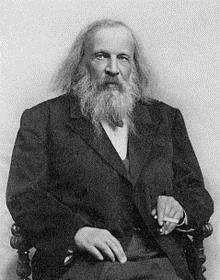 In 1869, Mendeleev proposed a law before classifying elements which is called the periodic law. According to Mendeleev, physical and chemical properties of elements are the periodic function of their atomic masses that is, on placing elements in increasing order of their atomic masses, elements having similar properties are repeated after a regular interval. This law means that on placing the elements in the sequence of their atomic masses, their properties change but after definite interval elements of approximately same properties is repeated. On the basis of this law, Mendeleev arranged all elements in its increasing order of their atomic masses in a table known as periodic table and this type of classification is called periodic classification. Periodic table has seven periods. First period has two elements and it is called the shortest period. Second and third periods have eight elements each. These are called short periods. Fourth and fifth periods have eighteen elements each. These are called long periods. Sixth period has 32 elements, however, only 18 elements may be seen in the table, but 14 elements of lanthanide series are also included in this period. Hence it is called longest period. Seventh period is an incomplete long period which has 28 elements, till now. Among them some elements are radioactive. It has many vacant blocks for elements to be discovered in future. There were only eight groups in the Mendeleev's periodic table because inert gases were unknown at that time. After their discovery, one more group was added in the periodic table consisting of inert gases. It is called zero group. Thus, the group number is nine. Eight from one to eight and one zero group. Except zero and eight group, all groups (I to VII) are divided into two subgroups A and B. Study of these groups reveals that members of a group resemble in properties to a large extent but some elements have different properties hence two subgroups were proposed in each group. convenience in the study of properties of elements : As the known elements are divided only into 7 periods and 9 groups hence, their study becomes easier. Now there is no need to study properties of each element separately. If the position of an element in the periodic table is known and properties of neighbouring elements are also known then general properties of an element can be predicted. In discovering of new elements : In Mendeleev's periodic table, there were many vacant spaces. Mendeleev even predicted the properties of the elements that would occupy these vacant places, when discovered. When a few elements were discovered later, then they were found to have exactly similar properties as predicted by Mendeleev according to their positions in the periodic table. Scandium, Gallium and Germanium are such elements which were discovered later. Even today some vacant spaces are there in the seventh period and discoveries are going on to discover. In determining atomic weight : If equivalent weight is known then by multiplying it with valency atomic weight can be calculated. Correction of inaccurate atomic weight : We know that the elements present in a particular group are similar in chemical properties. On this basis, Mendeleev placed Beryllium in the second group along with Mg, Ca, Sr and Ba. These are all divalent. Equivalent mass of Be 4.5. The atomic mass of Beryllium was found to be 13.5 assuming its valency 3 as it resembled Al in properties and thus it should be placed after carbon whose atomic mass is 12. Later Mendeleev determined the exact atomic mass by multiplying equivalent mass by 2 since it was found to be divalent metal. Helpful in researches : Mendeleev's Modern periodic table is the summary of whole chemistry. The behaviour of an element may be predicted by observing its position. This knowledge helped in many researches. Position of Hydrogen : The position of hydrogen in the table is not certain because it can be placed in I as well as n VII group as it resembles both, the alkali metals of IA group and halogens of VII A group. Hence it is placed in both first and seventh groups. Position of isotopes : isotopes of an element are placed in one group while their atomic masses are different. E.g. two isotopes of chlorine having atomic masses 35 and 37 are placed in one place. Position of elements of eight group : There is no appropriate place for elements of the eighth group in the table because none of its elements has valency 8 towards oxygen. Except this three elements are placed together. Position of rare earth elements : A group of 14 elements called rare earth group or lanthanides are placed together at one place while their atomic weights are different. Similarly, 14 elements called actinides are also placed together. Position of inert gases : Mendeleev had left no place for inert gases hence, this group is placed at the end of the table and is given the name, zero group. No explanation of diagonal relationship : Some elements of second periods show similarity with properties of elements of the third period and next group. This inter-relationship among elements is called diagonal relationship. Therefore, the similarity in properties is found between Li and Mg, Be and Al and B and Si. It cannot be defined on the basis of Mendeleev's periodic table and periodic law. Though Mendeleev's periodic table has some drawbacks it was a revolutionary work in the field of classification of the elements which opened the door for the discovery of modern periodic table . Modern science world is knowing information about more than 114 elements and have a periodic table prepared by Henry Moseley which makes the study more easy. But before the appearance of the modern periodic table there was many attempts that deserve respect. This resource is a brief write up about those attempts and their main principles. This resource is help for plus one students of Kerala state syllabus as it is related to third chapter in Chemistry. If you are in your prime reproductive age and you are having irregular periods and trying to regulate your periods in a natural way following easy home remedies, then just go through this article to find some simple and easy ways to get rid of your irregular periods and enjoy good health by regulating your periods. The Periodic law and Mendeleev's Periodic Table has brought a unique development in the classification of elements. It has helped the chemist in understanding the material characteristics of the elements and it has become a guiding force for understanding the chemistry in a better way. Even based on the periodic table, scientists were able to predict the elements which are later invented based on the predictions made. A chemist who understands the table properly can understand the whole subject of chemistry in a better way. Before Mendeleev and after Mendeleev, chemistry has developed enormously and made a way for many discoveries and it is really a revolution in the field of Chemistry. Even though there are some problems but the table is the best discovery so far for the people who want to know Chemistry in a better way.